EYEVISC PFS is intended for use during surgery in the anterior segment of the human eye. It is designed to coat & protect corneal endothelial cells and other intra ocular tissues and maintain anterior chamber depth. 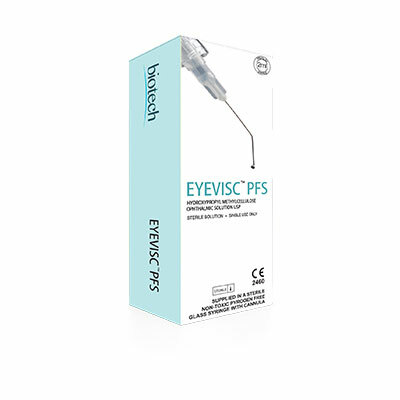 EYEVISC™ PFS is supplied as a sterile viscoelastic solution of Hydroxy Propyl methyl Cellulose USP 2.0% W/V in 2 and 3 ml pre-filled Syringe with 23 G Sterile Cannula. It possesses viscocity of 4500-9500 mPas.